I judged wine at the El Dorado County Fair last month (May 2103), and was fortunate enough to be placed on the panel evaluating about 30 Barberas. These placements are never an absolute pleasure. If you get a couple great hours, you pay for it with at least an hour from the bottom of the entry barrel. For my sins our panel also got five flavored sparkling wines, which I’ll never understand. How can US Secretary of State John Kerry look his French counterpart in the eye knowing somewhere in California our government is letting some beauzeau label and sell a wine called ‘Almond Champagne?’ That product should be employed for teaching forensic pathologists to recognize arsenic poisoning. The two Barbera flights, however, were exceptional. El Dorado is a small, one-day competition. They get about 800 entries, which is a third of what the State Fair gets. But El Dorado focuses on the Sierra Foothills. They will take entries from anywhere, but they only solicit them from Lodi and the Foothills. During their 25-year history, they’ve also done an admirable job championing varietals which seem to perform very well in the region. For the first ten years or so Zinfandel was the major emphasis, and organizers made an effort to recruit Zinfandel entries from Sonoma and Paso Robles to pit against Foothill offerings. Then there was a Rhônish period where Syrahs from France and Australia were introduced along with qualified speakers who taught seminars and served as guest judges. Recently this educational subplot has moved on to Italian varietals. Sangiovese is a big category, and a number of successful Pinot Grigios were entered. It was Amador County Barbera though, which stole the show. I should also give credit to the Mountain Democrat from Placerville which sponsored the competition this year. I’m sure they paid for my hotel room, and there was an unfortunate misunderstanding at the awards ceremony which I’d like to clear up. Seems I told one of their photographers that the volunteer help at the competition had been unusually young and good looking compared to the standard raft of wine competition volunteers one generally encounters around the world. I pointed out a particularly dazzling example in the audience, and suggested the photographer send me a couple candid images to use in this blog post about the event. Seemed innocent to me at the time. The girl is really pretty, she was wearing a short skirt, and her picture would draw one’s eye to this article involuntarily. Unfortunately, it turns out she is the daughter of the publisher of the Mountain Democrat. So not only have I not received any pictures, but I fear my own mug shot may be appearing soon in the paper captioned “Pervs to avoid in Placerville.” To be fair, I was merely pointing out the publicity value of the photograph. This isn’t exactly an X-rated website. Although, if she is his daughter, then she is probably young enough to be my granddaughter, and I suppose I could have gone about the request in a more decorous manner. Barbera is a really useful grape, and the 1,500-foot elevation contour through Shenandoah Valley of Amador County seems to be a sweet-spot for it in California. But this is relatively new information. It is in northwestern Italy that Barbera has seen its widest acclaim. Simply put, and very much in the Italian tradition, there Barbera is ‘every day’ wine. For thousands of years Italians have viewed wine, not as art or fashion, concepts with which they are certainly well acquainted, but as food, a staple of the economy like eggs and pasta. And north of the Apennine Mountains, in the upper reaches of the Po River Valley, the beverage you had ‘every day’ at the dinner table was wine made from Barbera grapes. Not a bottle ~ rather carafes filled from barrels, or from 17-gallon demijohns. It is one of very few wines in Italy which carries a grape name ~ Barbera ~ instead of a place name. Moreover, it is extremely unusual for the name of a grape or a wine to be expressed in the feminine gender, again reflecting the ‘every day,’ nutritional role in which this particular grape and wine have historically been viewed. Nebbiolo (which makes Barolo and Barbaresco, two place names) is the artistic grape of Piemonte. There are 15 times as many acres (70,000) of Barbera planted in Piemonte as there are of Nebbiolo. And Barbera isn’t unique to Piemonte. It has been planted in enough other areas to compete for second place among the most widely planted Italian red grapes. Nebbiolo is a special occasion wine, when someone wants to show off. Barbera is what you drink with your family. The style of northern Italian Barbera (say Barbera d’Asti, of which Coppo has a very reliable example called Camp du Rouss) is dark colored, with minimal tannins and pronounced, refreshing acid. Nebbiolo is the opposite: strong tannin, weak color, needs time to resolve the tannins. Barbera is very attractive when young, with food. The acid exaggerates flavors in the food (particularly helpful with tomato sauces), and the color (which will go orange-ish in time) can be vibrantly purple. Flavors are assertive, with a range from cherries to fragrant herbs. Less sunny vineyard locations (say the north side of hills in Piemonte) can often deliver spicy nuances. Italian Barbera is ideal for pasta if you follow the Italian dictum to merely flavor the pasta with sauce; don’t serve a sauce soup with pasta in it. Barbera in California is a somewhat less defined story. It has been here since at least 1880, when it was reported planted in a Cupertino nursery. It was widely planted in the Central Valley as a blending grape, to contribute color and acid. Today there are 6,300 acres in California, and 5,050 of them are in Madera (20%) and Fresno (80%) counties. Sonoma has a paltry 64 acres, and Napa has about ten. Amador County only had 170 bearing acres in 2012, but had planted an additional 17 acres which were as yet unbearing. Of course acreage must be seen as a relative figure. Amador has about the same amount of Barbera as it has Syrah, 50% more than it has Sangiovese, much more than it has Merlot (24 acres), and much less than it has Zinfandel (2,000 acres). This distribution may help explain the style of wines we encountered at El Dorado Fair. The good ones fell into two categories: (1) leaner, more fragrant, with brighter acid (what I’m inclined to call the Italianate style); and (2) bigger, blacker, more rigidly structured, and more intensely flavored (for the time being let’s call that the Amador style). It is well understood Barbera vines are vigorous. Left to their own devices, they will produce a big crop, with low tannin and mediocre aging prospects. Increased vine age will gradually raise tannin levels, concentrate flavors, and improve aging prospects. It is unclear how reliably these stylistic features can also be achieved by reducing foliage and production through pruning and water denial, but a decade of experience in Amador seems to imply this will be the case. The first category, the Italianate style, may well turn out to come from higher elevation (read cooler) vineyards in California. A good example was Gold medal winner Illuminare 2010 ($24) from Camino east of Placerville in El Dorado County. 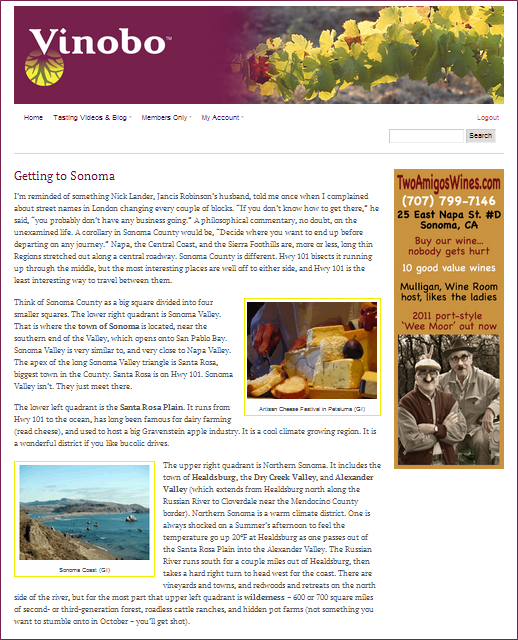 Further evidence was provided by the 2010 Nevada City ($30), which comes from Boa Vista Vineyard, also in Camino. The Illuminare was medium-bodied with spice and florals in the nose. A very nice wine. The Nevada City was more unusual, with a big whack of black pepper in the nose, but still pretty good depth. Much more prevalent were gutsy, Californicated Barberas with very dark purple colors, monster fruit noses, and concentrated flavor profiles. All these winners were from Shenandoah Valley in Amador. Bray Vineyards 2010 ($22) won the Sweepstakes Award with a wine which was simultaneously bold and had a softly persistent finish. Equally high on my score card was a Runquist 2011 ($32), which had a fabulous fruit nose and a nice dollop of vanilla, and the Macchia Righteous 2011 ($22), which was impeccably balanced. Any of these three wines would be a superb match to Moroccan Lamb Merguez or to wild boar sausage. Get the sausage online from D’Artagnan. Make the Merguez yourself with ground lamb and your choice of spices (garlic, paprika, cumin, vinegar, coriander, Tabasco). Serve with couscous and Sultana raisins. Note two things. First, my impressions come from a blind tasting. All wines arrive in front of judges in glasses with code numbers. We do not even know what wines are entered. We do not get the Key (winery names and code numbers) until ten days after the event. Second, some wineries make several iterations of a grape variety in a particular vintage. Macchia, for instance, makes nine or ten Zinfandels every year. Runquist has three Barberas from 2011. You want to get the right wine! Macchia has a 2011 Barbera called Infamous which is not even close (13.8 pts out of 20) to the quality of their 2011 Righteous (18.5 pts). Runquist is not as critical. Their three Barberas ($32, $26, and $22) got 19.5 pts, 19.0 pts, and 17.8 pts from me. Next Next post: New World Albariño. Hope You’ve Got a Thick Skin.